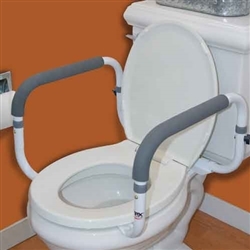 Safely sit or stand at your toilet with this compact Toilet Support Rail featuring comfortable and easy-to-clean Hypalon cushioned grips. This easy-to-assemble rail fits a wide range of toilets and has adjustable handle widths. Other Features & Benefits: Adjustable handle width from 16” to 18” between arm. Specifications: 11” x 21” x 16”.